Continuous cryogenic grinding in RETSCH's CryoMill. Watch the video here. No communication between PC-Lambda 25. Please help. Advise this member. Motor continuously jams and errors out. Unable to continue an essay. Advise this member. Touchscreen display panel will not light up. Tried with know good one and it worked fine on the pc board. any troubleshooting besides swapping it out that anyone knows?? Heracell 150i. Advise this member. 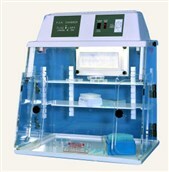 This chamber has been designed to help improve the accuracy of PCR and general Tissue Culture procedures. The chance for air-borne contamination during D.N.A. sequencing is greatly reduced. The chamber is a "still air enclosure" which contains both fluorescent and U.V. germicidal lamps. The U.V. system is rated at 254 nm and will decontaminate all surfaces of the interior. The lamp should be activated 15 minutes prior to and 15 minutes after planned use. Read more about the PCR Chambers on the PLAS-LABS website. Unit powers up and works great. This item was removed from a working environment. Please feel free to ask question(s) if you have any. Thank you for your time and Business. The drug discovery industry has been through a tumultuous transformation over the last 10 years. The dust now appears to be settling and out of it, new business models, advances to existing methods, and key enabling technologies have emerged to set a new course for the industry. While the objectives of drug discovery haven’t changed, the way the industry achieves them has changed dramatically. Researchers now have access to a device that enables reliable, leak-free custom development of protein gels for electrophoresis. Developed for simplicity and with an intuitive design, Thermo Fisher Scientific’s newly launched SureCast Gel Handcast System also helps to save time, money and precious samples. Read more. The new kit offers all of the advantages of the original Thunder-Link technology, but now also works with antibody fragments and small proteins. Thunder-Link PLUS provides antibody and oligo activation in just 30 minutes, and oligo conjugation in only 1 hour, with no lengthy protocols. The kit enables excellent antibody and oligo recovery, with a robust and flexible clean-up procedure. Read more. The new Ziath HandHeld scanner can be operated using one hand and incorporates a lightweight build and intuitive interface that’s easy enough for anyone in the lab to use. Its portable nature is perfect for a number of underserved applications, including the generation of multiple pick lists for accurate tube selection, vial checking to confirm your sample is what it says it is, and the ability to easily record samples in the field at the point of collection. Read more. As an innovative and globally active company, Heidolph are a leading manufacturer of laboratory equipment with a local footprint in more than 100 countries. They support laboratories in the pharmaceutical research, the cosmetics, biology, bio-fuel, and chemical industries with their products and services, significantly contributing to the improvement in the quality of people’s lives all over the world. Their organization is headquartered in Schwabach, a city within close proximity to Nuremberg, Germany. It is there that the development and production of theirr equipment; as well as the coordination of their domestic sales, international sales, marketing and customer support activities are located. They strive to make your research easy with their products here at Heidolph Instruments. What is the max % you can get this device analyze? Looking for one that will go up to 90%. Advise this member. I would like know how the manifold is cooled? I have a problem. The manifold warms up after 45°. Thank you very much for your attention. Advise this member. What is the recommended calibration schedule / frequency for this pump (Gast Vacuum Pump and Compressor Model DOA-P704-AA). Also, please provide a company that will perform the required calibration nearby our location. Advise this member.